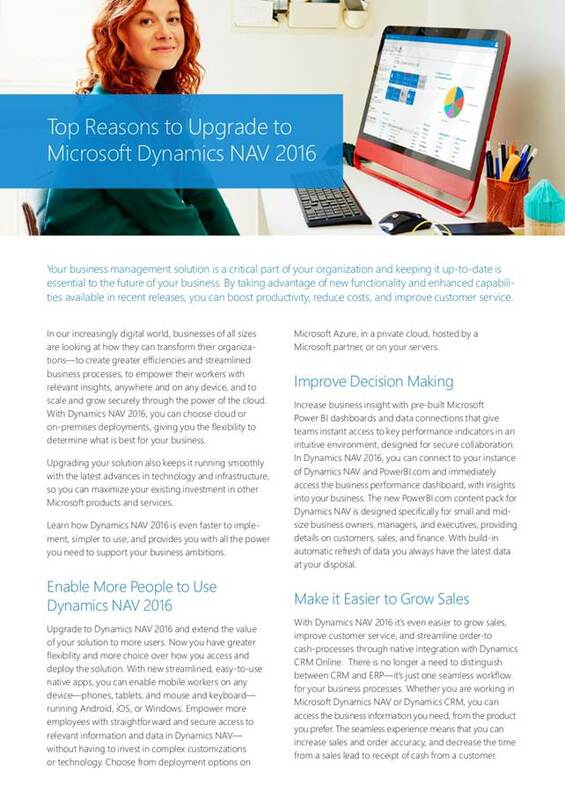 .. and NAV 2015/2016 best Features …nice Microsoft official document about “NAV 2016 Upgrade Top Reasons” below. MS Dynamics NAV is an ERP system intended to help small and medium enterprises with manufacturing, finance, supply chain and customer relationship management, ecommerce and analytics. 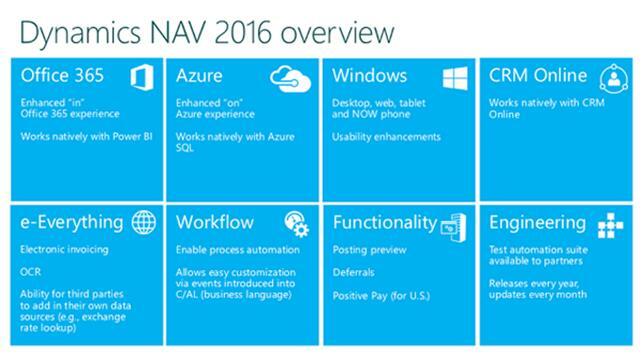 Its latest version NAV 2015 provides significant capabilities but Microsoft is planning to offer much more in NAV 2016. But in this article, I will primarily summarize enhancements in NAV 2015 and 2016 that introduce considerable advantages to performance and usability. Also, an emphasis will be placed on the main improvements that have been done and will be done. · In NAV 2015, improved Server and Service Tiers help to decrease the amount of traffic among SQL Server, Dynamics NAV Server and client. This enables better network performance – business logic runs only on the NAV Server tier now. · Starting from NAV 2013 R2, WEB client has already provided better performance because most of the processes are executed by the Dynamics NAV WEB server. Changed cache usage: Now, Dynamics NAV Server is responsible for caching the requested data for all users; in old versions, every connection required its own cache every time. MARS (multiple active results sets) implemented: Functions Find(‘-’), Find(‘+’), Next work faster. Filtering on FlowFields mainly processed with a single SQL statement: Previously, filtering on FlowFields was called as an SQL statement for each filtered FlowField and for each record in the table in order to calculate the filtered FlowFields. Added a new Object – NAV Query: It allows building queries in a single SQL command and getting read-only results which work faster than table-based data. · NAV 2015 client is available on Tablets and NAV 2016 client will be also available on mobile devices. · Both Nav 2015 & 2016 provide excellent integration with native Business Intelligence and Office 365. · Excel capabilities and Power BI allow you to analyze and visualize data. · Word Templates help you create your own templates for any kind of document reports and import them to NAV. · In NAV 2016, it will be possible to integrate with Online Dynamics CRM to extend enterprise possibilities. · Starting from NAV 2015, you can easily schedule reports in the Report Inbox section of Role Center. For printed reports it is also possible to choose the output format of the Layout – Word, Excel or PDF. · In NAV 2015, the Mandatory Field property was added. Now, it is easier to manage the user interface without adding a new checking code to triggers and functions. 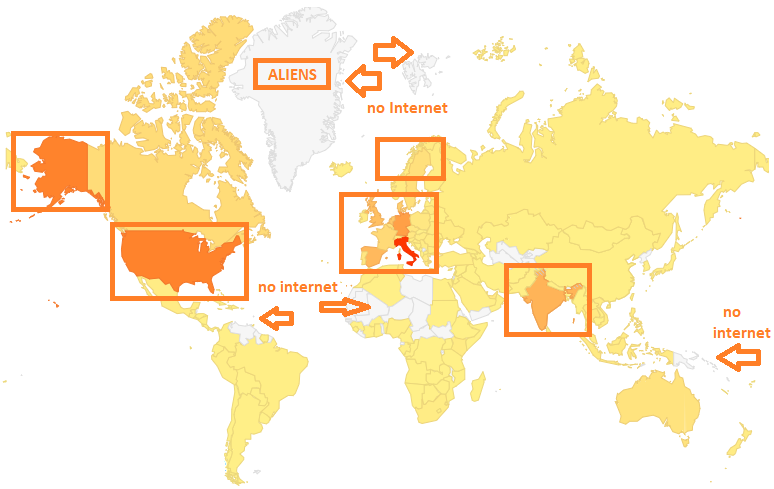 Also, it becomes user-friendly interpretation of such fields. 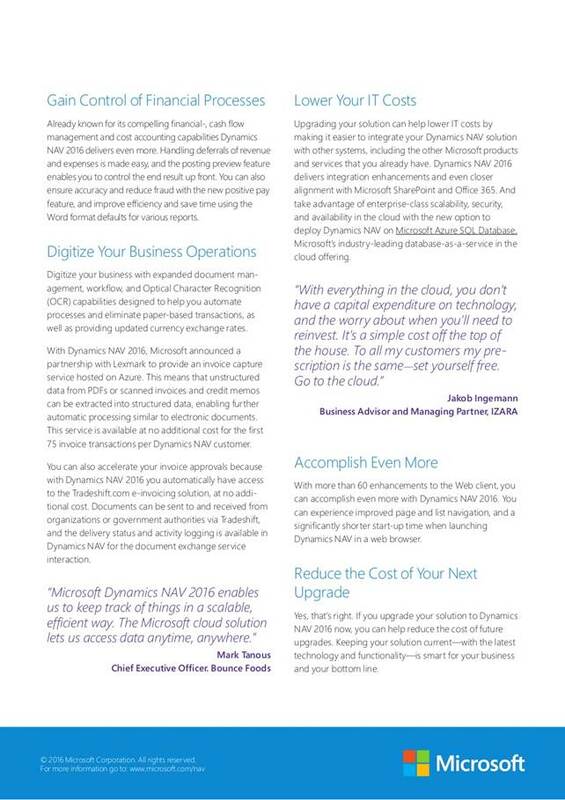 · In NAV 2015, Bank Data Conversion Service on Microsoft Azure enables automatic processes for electronic payments. There were prepared some template functions for the biggest banks to make Dynamics NAV flexible for export/import payments and receipts. · In NAV 2016, workflow enhancements are expected to improve customized automation around billing, HR and Payroll, financial and other critical functions. · And the last quite useful and important feature of NAV 2015 is the possibility to simplify the user interface in the UI Removal feature. You can delete unused fields and/or actions on the pages. And that makes pages easier to observe and navigate.